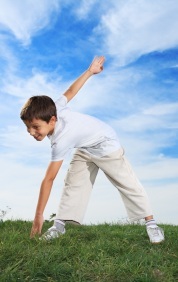 While there are a significant number of people on both sides of the fence as it relates to Brain Gym’s trademarked series of movements and whether or not they work, there IS a significant amount of scientific evidence that movement (particularly cross-lateral movement) can help kids anchor thought and prepare for school or homework practice. Before school starts, why not make up a 2 minute “learning cheer” that you and your kids can do together both before the beginning of the school day and before they sit down for homework practice. It helps create a routine (much like a bedtime routine helps prepare kids for impending bedtime), gets blood flowing to the brain and, if your child’s thought processes ARE, in fact, anchored by the movement, all the better. Try to incorporate both stretches and calisthenics in your learning cheer. (Especially ones that cross the body’s midline!) Or get fancy with some traditional cheerleading jumps.